It would have been wonderful if the onstage nuclear scientists waiting for detonation of the atom bomb at Los Alamos had been accompanied by a real live storm but there was only a brief shower. We reflected upon the night at the Santa Fe Opera when the final scene of Verdi's Rigoletto was accompanied by real thunder and lightning, making for one exciting operatic experience. Well, Doctor Atomic is no Rigoletto and John Adams is no Verdi; we doubt that audiences will be clamoring for this work in the 22nd c. However, if we accept the message of the evening, there may be no 22nd c. The part of the evening we enjoyed the most was the pre-opera lecture by Director Peter Sellars in which he made some very good points about the nuclear age and why he chose to present it as contemporary, with Gabriel Berry's costumes belonging to our present day. Although we strongly disagree we enjoyed hearing his rationale. We enjoyed even more the talks we heard from three of the Downwinders--an elderly woman, her daughter, and her niece--all suffering from crippling anxiety related to the decimation of their family by cancer, a consequence of the 1945 detonation of the world's first atomic bomb. Apparently, the government's fund to compensate the victims of fallout and radiation has not been extended to New Mexicans, a condition the Downwinders have been fighting for several years. The stories they shared were terribly tragic. The government did not evacuate them for fear the press would find out that "something was going on". 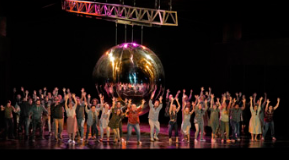 The production of Doctor Atomic, taking place just a stone's throw from Los Alamos, seemed to be a risk for the Santa Fe Opera but they put all their resources behind it and succeeded in selling out the entire run. Not only did we get to hear the voices of the afflicted but we got to watch members of nearby pueblos performing a corn dance onstage, a form of prayer for healing and for water to nourish their corn crop. The stage was filled with Downwinders who probably had as many tragic tales to tell as the three we heard in the lecture. Our desire to learn about this tragedy created by the military/science complex was not matched by an appreciation for the opera itself, in spite of some stellar performances by artists we know and love. This lack of affection for the work is not due to the fact that it is political. Verdi himself wrote several operas with political themes, both overt and covert. But he did so with glorious music and singable melodies. Although there were a few moments when Adams' orchestral colors pleased our ears, for the most part the music is harsh and dissonant. Peter Sellars' libretto is nothing if not "wordy". The text was derived from government documents, wire-tapped conversations, surveillance reports, first-person accounts, scientific data, and poetry loved by the Oppenheimers; none of it is singable, nor is the vocal line melodic in any way, shape, or form. The fact that the voices were amplified, as Adams stipulated, did nothing to enhance the listening experience. NATO would describe the opera--No Action Talk Only. There is only the conversation about the Manhattan Project, the waiting, and the concern with the weather. Emily Johnson's choreography involved some highly generic modern dance to give the illusion of movement--eye candy that was more sour than sweet. David Gropman's set was bare, save for a huge suspended reflecting ball. Now that we got the negatives off our chest, let us relate the positives, which involve some pretty swell performances. Bass-baritone Ryan McKinny establishsed the complex character of Dr. J. Robert Oppenheimer whilst the exceptional soprano Julia Bullock excelled at limning the character of his neglected wife Kitty. Most of her singing involved texts of poet Muriel Rukeyser which was abstract to the point of incoherence. We have written that Ms. Bullock could sing the phone book. This came close. In the sympathetic role of the physicist Robert Wilson, tenor Ben Bliss' youthful timbre was just right for the part. His "aria" whilst climbing to the top of the tower was probably the most musical part of the opera. Contralto Meredith Arwady lent her distinctive sound to the role of Pasqualita, Kitty's Tewa housekeeper. Her singing of a Tewa native song was rather more listener-friendly. General Leslie Groves was the U.S. Army Commander of the Manhattan Project, a demanding, aggressive, and overweight man; bass-baritone Daniel Okulitch got the first two qualities just right but the banter about his weight and his diet didn't make sense since Mr. Okulitch is admirably fit. Bass Andrew Harris portrayed the physicist Edward Teller and baritone Tim Mix took the part of the chief meteorologist for the Trinity test site. General Groves was casting shade on him for not producing better weather! Apprentice Mackenzie Gotcher lent his tenor to the voice of Capt. James Nolan who, as chief of the post hospital at Los Alamos, expressed concern for the well-being of the scientists working on the Manhattan Project. Most enjoyable for us was the chorus composed of Apprentice Singers. They blended onstage with the Downwinders and provided some visual as well as aural interest. The evening ended with a standing ovation, dear readers, so our comments are not meant as a value judgment, rather as the opinion of one opera lover who wants to be entertained. Mr. Sellars' libretto might have made good reading but those words we heard never begged to be set to music. Nor was any provided.